Today, more and more people are seeing the benefits of working from home. In 2017, remote work was the fourth most popular job search term used by people looking for jobs. This is no surprise: Working from home reduces stress, increases family time, saves money on gas and other costs, and eliminates hours of commuting time each week. We have an entirely remote model, with more than 100 team members working from home. Since many of us still struggle with the challenges on an ongoing basis, we decided to survey our team members to identify their biggest challenges - and their top tips for overcoming them. Don’t work from your kitchen table. Even if you don’t have a home office, Rony, one of our team leads, suggests you should “have your own ‘office space’ to ensure that you can work properly and without distractions.” Invest in a comfortable chair and any other ergonomic tools you need. And keep your work space clean and organized, says Martin, one of our team members, so it feels like an actual work space and not just another cluttered counter. At home, there are so many things to do other than work - you could be doing the dishes, watching your favorite TV show, playing with your kids or taking a nap instead of actually focusing on the job at hand. So schedule regular breaks, to give your brain a break and allow your mind to wander. If you need to, set an alarm, and stop working when the alarm goes off, no matter how “in the zone” you are. According to one recent study, workers should have a 17-minute break for every 52 consecutive minutes of work. If that’s not possible, it’s ok, but breaks are critical for your mental health and productivity. Take a walk around the block or, if the weather’s bad, do two minutes of jumping jacks in your living room (hey, no one’s watching). Call your mom, or a friend who also works from home. Read a good novel. Just make sure your brain has time to relax and recharge. Family can be distracting as well. Make sure to set guidelines on when it’s acceptable to disturb you. If you don’t have childcare, prepare snacks ahead of time so your kids won’t have to constantly ask you for a sandwich. Chel, another team lead, tells her kids that working remotely still involves doing actual work, and gives them tips on how they can make things a little less stressful for her when she’s working. In the office, the kitchen or the water cooler provides a good excuse to take a break and gather with co-workers. When you work from home, you need to create your own water cooler. Don’t let distance keep you from connecting with co-workers. If your company isn’t already on Skype or Slack, tell them to get with the program. Our team members are constantly engaging on Skype, our primary communication tool. We have a chat group for the whole company and others for specific teams or affinity groups. Team members always say “hi” when they get in and let co-workers know when they’re going on break. And don’t be afraid to start virtual clubs or affinity groups. One of our senior engagement managers, Frank, founded the Gamers Group for gaming experts, fans, and players within the company. The biggest challenge of working from home is feeling like the work day never ends. So set two routines – one to wrap up at work, and one to help you feel like you’re home. Hannah, our COO, likes to set her priorities and her schedule for the following day, so she doesn’t have to spend family time thinking about her to-do list. Jon, our CEO, admits that he likes to have a drink to wind down. Our director of talent, Judy, will completely log off from Skype and go to the nail salon. 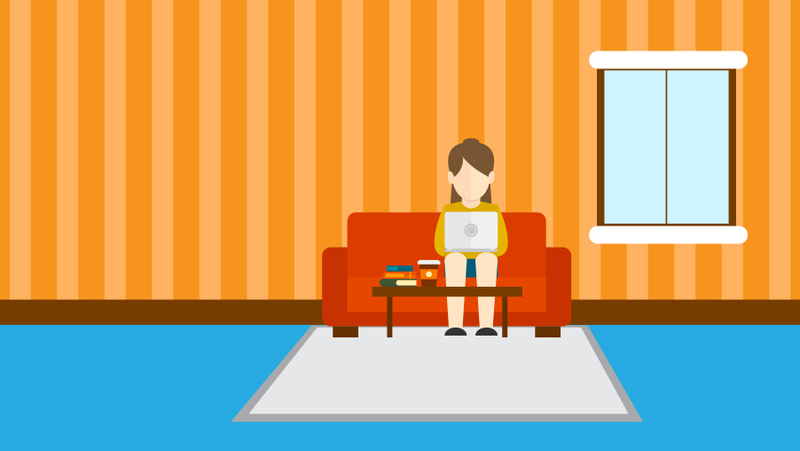 Working from home isn’t easy – but it doesn’t have to be a medical emergency. You can make it work if you get your space right, build breaks and socialization into your day, and set boundaries between work and home. And top it all off with a manicure … or a glass of whiskey. We won’t tell. Edited by Hannah Clark Steiman.